(i). Indian candidates who Passed in their Intermediate/12th class examination in science stream having 50% marks in Mathematics, Physics and English can apply for these air force jobs in India. (ii). Those who have 3 years Diploma Course in the following stream: “Mechanical / Electrical / Electronics / Automobile / Computer Science / Instrumentation Technology / Information Technology” with 50% marks in aggregate can also apply for this Indian Air force recruitment 2018. 2). Profile Name: Group ‘Y’ (Non - Technical). (i) Air force recruiter mentioned that those who have passed in their 12th class examination in any stream with 50% overall marks can apply for these Air for jobs. (ii) Candidates who passed the 2 years Vocational Course affiliated by CBSE / State Education Boards / Councils duly recognized with at least 50% marks in aggregate can apply for these posts. Education: 12th pass , Diploma Holder can apply for this posts. What Application Fee we have to pay for applying these Air force jobs? Air force recruiter said that the candidates who want to Join Indian Air force have to pay the examination fee of Rs.250. Candidates can pay the examination fee by using online payment mode. The various mode of payment are: “ Debit Cards/ Credit Cards/Internet Banking”. You can use any of these ways for the payment of application fee. What is the process for applying these Air force Jobs? 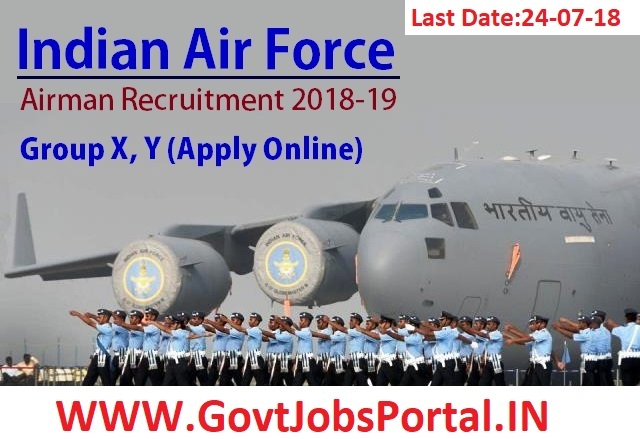 Those who wants to join air force through this Indian air force recruitment process have to apply online. Air force recruiter mentioned in the notification that there is no other way for applying these air force jobs. You can only apply through online mode. Under IMPORTANT LINK section below we share the link for advertisement as well as for online application. 3RD July 2018 is the starting Date for applying online. 24th July 2018 is the Last Date for applying online.